Environment Canada meteorologist Alexandre Parent has analyzed data going back decades and says he can't find a similar storm. The closest example is 1920, he says. It's snowing. It's blowing. And it's very, very cold. 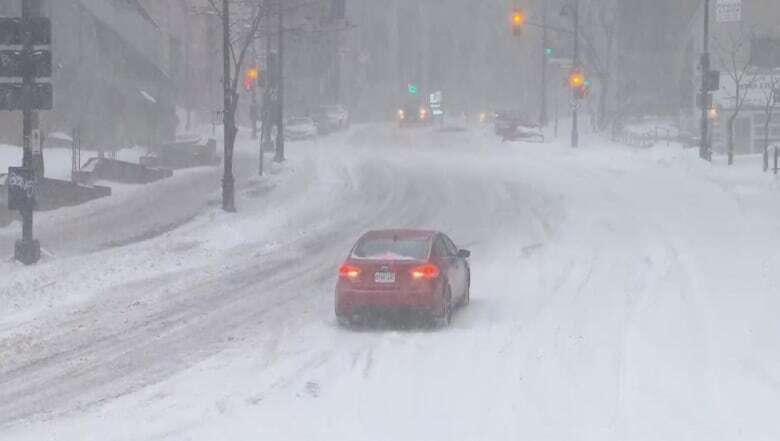 From eastern Ontario to the Maritimes, Environment Canada is warning of winter storm conditions that include snowfall, strong wind, extensive blowing snow and extreme cold. This "snow, cold and wind" combination rarely occurs in Quebec, according to Environment Canada meteorologist Alexandre Parent. Usually, he said, the temperature rises during snow storms. He has analyzed data going back decades for southern and central Quebec and "I cannot find a similar storm." In Quebec City, the temperature hovered around –17 C Sunday afternoon and it was –18 C in Montreal with snow accumulation expected to reach 15 to 25 centimetres in both regions. But Quebec is not alone. Toronto residents were digging out from under 10 centimetres of snow Sunday, expecting temperatures of –24 C by the evening. Wind chill values could feel as low as –38 overnight there. 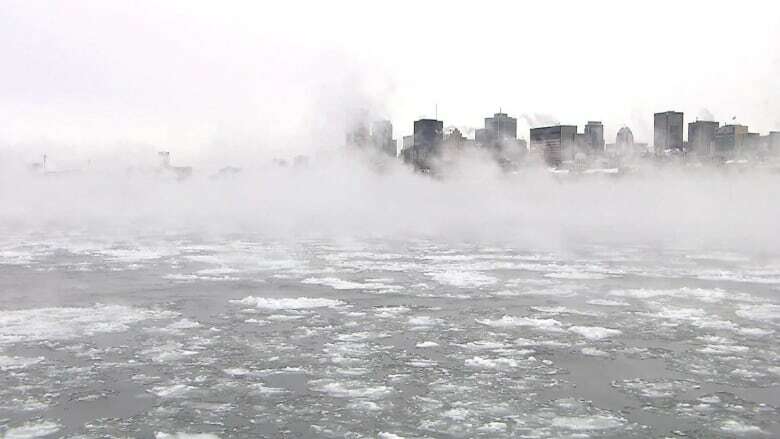 In eastern Ontario, temperatures will only rise slightly to a high of –16 C, with winds gusting up to 40 km/h and another seven to 12 centimetres expected to fall by Monday morning. Northern New Brunswick is bracing for 30 to 50 centimetres of snow expected with snow changing to ice pellets and freezing rain in the afteroon or evening. The storm may drop as much as 30 centimetres in the Beauce region and more than 50 in the Gaspé area. Authorities are urging drivers to postpone non-essential travel until conditions improve and sections of several highways and roads are closed due to weather conditions. Toronto police said about 100 crashes were reported Saturday afternoon into Sunday morning, with drivers sliding into ditches, clumps of trees and other vehicles. At the Trudeau International Airport in Montreal, many arrivals and departures after 7 a.m. have been delayed or cancelled entirely. Travellers should check their flight's status before heading out. The same can be said for Quebec City's Jean Lesage International Airport where most, but not all flights within Quebec were cancelled for the day after 8 a.m. However, many flights, such as those flying to or arriving from outside the province, are still listed as on time. According to Transports Québec, the New York Department of Transportation banned trucks and buses from crossing the border at Lacolle in Quebec and Champlain in New York starting 3 p.m. Saturday for an undetermined period of time. The detour, the transportation agency says, is Route 11 — the Rouses Point crossing. In addition, a number of flights have been cancelled at the Macdonald–Cartier International Airport in Ottawa. Anyone set to travel is urged to check their flight status before heading to the airport. The snow-clearing operation in Montreal is already well underway, and workers are expected to finish plowing and salting or spreading abrasives by Sunday evening, said city spokesperson Philippe Sabourin. "Every street will be plowed by the end of the day," he said. He told CBC that people should take public transit and leave their cars at home on Monday and that operations to remove the snow will begin at 7 p.m. on Monday evening. Residents can monitor the city's Info-Neige app for updates on where the snow removal is taking place and what areas will be affected. In Ottawa, an overnight parking ban will be in effect between 1 a.m. and 7 a.m. Monday, as crews work to clear city streets. Vehicles won't be allowed to park on the street during that time, but on-street parking permit holders are exempt, the city said. Free parking is being offered at all city-owned covered parking garages during that time. Due to the weather and the road conditions, all STM bus lines that normally run on some of the city's steeper hills are being rerouted, Montreal's public transit agency says. Bus lines 11, 35, 36, 61, 75, 124, 168 and 711 are all rerouted, the STM tweeted Sunday. Cars and buses were slipping and sliding throughout the city Sunday, struggling to climb some of Montreal's steeper hills. Even within the city, pedestrians and drivers alike struggled with low visibility in the heavy snowfall and blowing snow. Thousands were without power Sunday morning in Montreal's West Island, with numbers reaching more than 13,000 at the outage's peak. Hydro-Québec spokesperson Jean-Philippe Rousseau told CBC the problem originated at a Baie-d'Urfé substation just before 6 a.m. There was an equipment breakdown that affected distribution lines, he said. Power will be restored gradually throughout the morning, he said. At around 8:15 a.m., he said 3,200 customers were still without power. That number was closer to 2,000 by noon. As the day progressed, power outages affected thousands of hydro clients. There were power outages reported in areas such as the Laurentians, Montreal's South Shore and Laval.